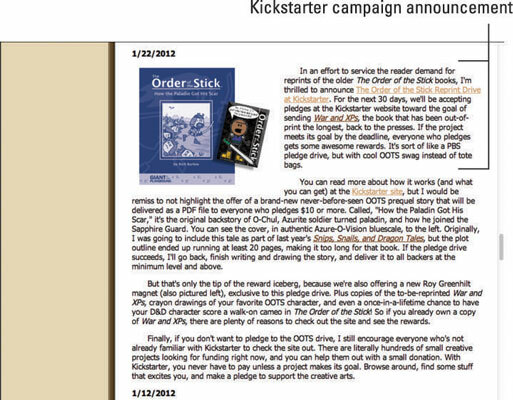 Here is an example of how a successful Kickstarter campaign for The Order of the Stick, organized by the comic’s creator Rich Burlew, used both of these elements. 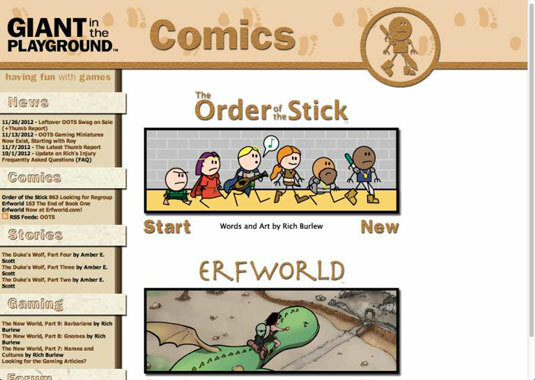 The Order of the Stick wasn’t a new product when it launched on Kickstarter; it had started in 2003 as a once-in-a-while strip on Burlew’s personal web page. Created as a satirical version of a Dungeons and Dragons type game, this comic features stick-figure style characters competing in a fantasy role-playing scenario. Over time, the comic expanded to several times a week and grew a very large following. In 2005, Burlew began publishing the comic in printed form in basic books. For several years, he published the comic books through his own production house. However, this proved extremely expensive and eventually he found himself unable to continue production. In January 2012, Burlew launched a Kickstarter campaign to get his books back into production. His goal was $57,750, enough to reprint a select run of books. He ended up with more than 20 times that. The campaign raised more than enough to reprint the entire series of all the books published up to that point, as well as fund eight new titles to be published over the next year. 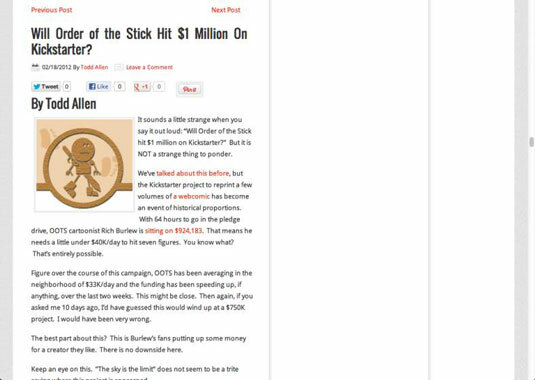 The Order of the Stick had spent several years before the Kickstarter campaign building a fan base. Through publication of the other comic strips and printed books, Burlew had an existing network of thousands of followers through the strip’s existing website (Giant in the Playground). Burlew launched his Kickstarter campaign through his website, communicating directly to his fan base. 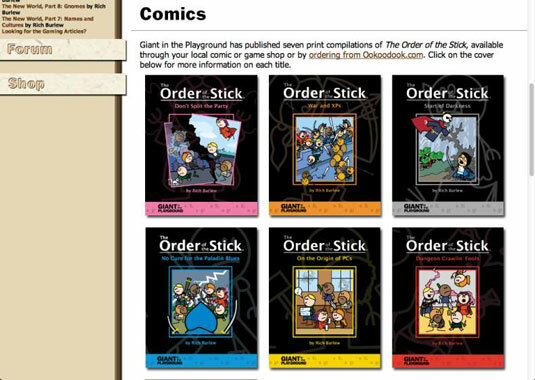 The Order of the Stick was also already a part of several existing online communities focused on role-playing and web comics — and received exposure for its Kickstarter campaign on ComicsBeat. 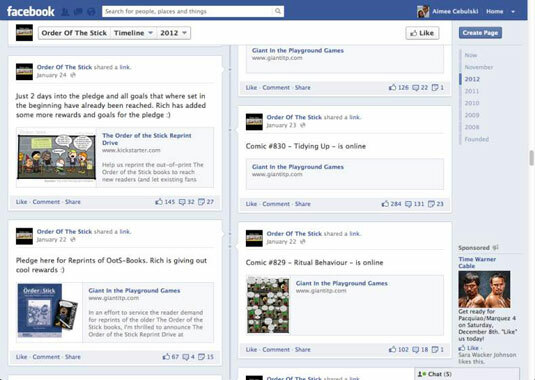 Facebook is a great way to communicate with your potential backer group and spread the word about your Kickstarter campaign. Because Order of the Stick was an established product with an existing fan base on Facebook, posting heavily on the strip’s Facebook page and providing a link to the Kickstarter campaign was a logical choice. Another reason this campaign was so successful was the extreme diversity and variety of pledge levels and backer rewards. It wasn’t just a few high-rolling backers giving tens of thousands of dollars to meet this goal; it was thousands of individual smaller backers — which is the true power of crowdfunding. $26 reward (772 sold): One newly printed copy of On the Origin of PCs plus a Roy Greenhilt magnet, shipped anywhere in the United States. $49 reward (74 sold): PATIENCE for a SIGNED PRINT: The 8×10 art print, autographed by the author, plus the Roy Greenhilt magnet and the coloring book and stuff. Add any one signed book for an additional $45. $240 reward (25 sold): A complete set of all 8 limited-edition Order of the Stick (OOTS) holiday ornaments from 2004 to 2011, signed by the artist, Rich Burlew, plus a Roy Greenhilt magnet. 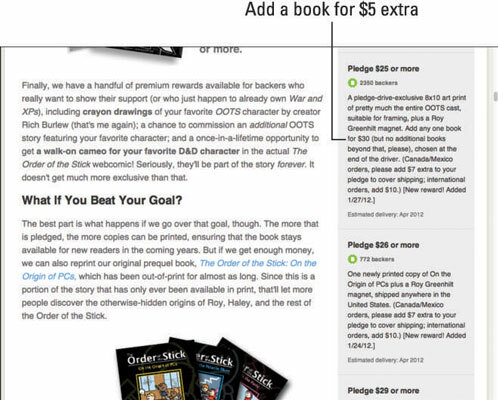 Add one signed copy of every OOTS book for $262. $675 reward (10 sold): PATIENCE for YOUR D&D PARTY: An original full-color crayon drawing of your D&D party (or party from another RPG, up to 6 characters) based on your descriptions, made and signed by Rich Burlew and shipped anywhere in the world, plus six Roy Greenhilt magnets, six of all the other free stuff, six art prints, six patches, and one copy of the Sticky Shticks expansion. With countless characters in the series, one of the rewards was the option to choose a character to feature in a new story; three backers chose this reward. 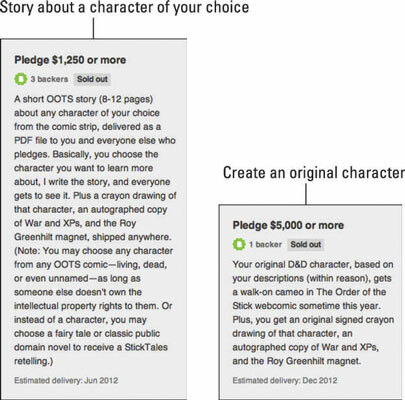 One backer even selected the highest-level reward ($5,000), giving the backer an opportunity to actually create an original Order of the Stick character, working directly with the creator. There were many levels to choose from. Rewards built upon each other, making the jumps in backer levels worthwhile. The rewards were different enough to have something for every type of fan. There was a sense of urgency (some rewards only had very limited availability). Many of the rewards were for pledges under $50, allowing a large number of backers to get involved. Another area where The Order of the Stick was successful was throwing in perks — added features that served as premiums at various backer levels. What made these add-ons extremely successful is they usually came with an additional backer contribution. For example, if you chose a backer reward at $25, you could upsell the pledge to $30 in exchange for adding another book to your reward. This incrementally small increase in rewards allowed the campaign creator to increase his overall funding by slightly enhancing the amount each donor pledged.